As Asean prepares to celebrate its 50th anniversary in October it is an opportune time to review the regions success over that period. From representing just 12 per cent of global gross domestic Product (GDP) in the early 1960s, the wider Asia-Pacific region now accounts for 31 per cent. A report by the Asian Development Bank (ADB), Key Indicators for Asia and the Pacific 2016 (KIAP2016) released late year attributes much of the growth throughout the Asia Pacific region to four countries – the People’s Republic of China (PRC), India, Japan, and the Republic of Korea – the first two of which surpassed populations of one billion people during the period. Key findings of KIAP2016 include that in almost three-quarters of Asia-Pacific economies the service sector accounts for more than 50 per cent of GDP. Manufacturing output, it noted, had increased in 16 out of 48 ADB member countries between 2000 and 2015. In 2015, the report states, the Asia-Pacific region generated two-fifths of global GDP (in 2011 purchasing power parity terms). Greater wealth in the Asia-Pacific region has brought with it considerable social progress. A newborn today will live on average 25-years longer than his/her counterpart born in the 1960s. This can be largely attributed to government spending on health as a percentage of GDP has increased in about two-thirds of the region’s economies since 2000. 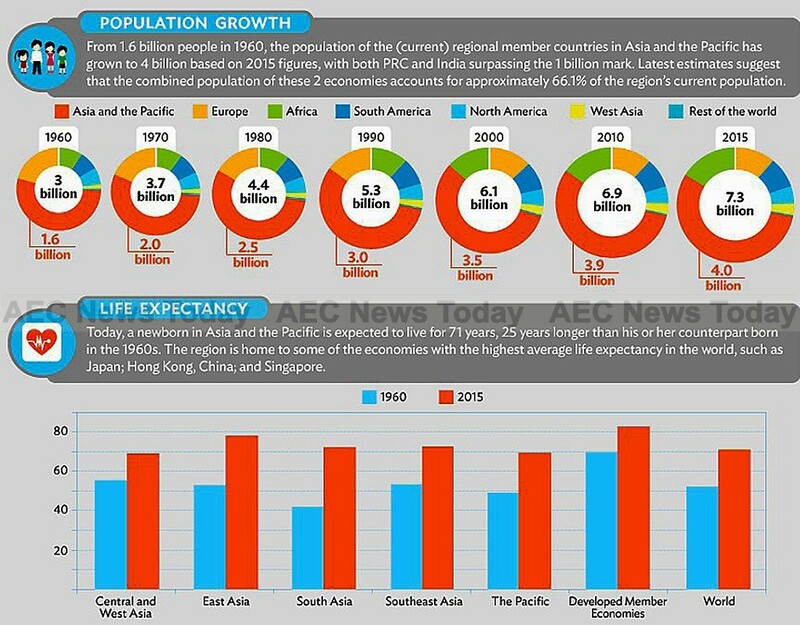 According to the ADB a newborn in the Asia-Pacific region is expected to live for 71 years, with some economies in the region – Japan, Hong Kong, China, and Singapore – boasting some of the highest average life expectancy in the world. However, the prospering economic times enjoyed across the Asia-Pacific region has seen a corresponding increase in carbon dioxide emissions. Accounting for about 45 per cent of global energy use, Asia-Pacific region greenhouse gas (GHG) emissions have grown faster than the global average. 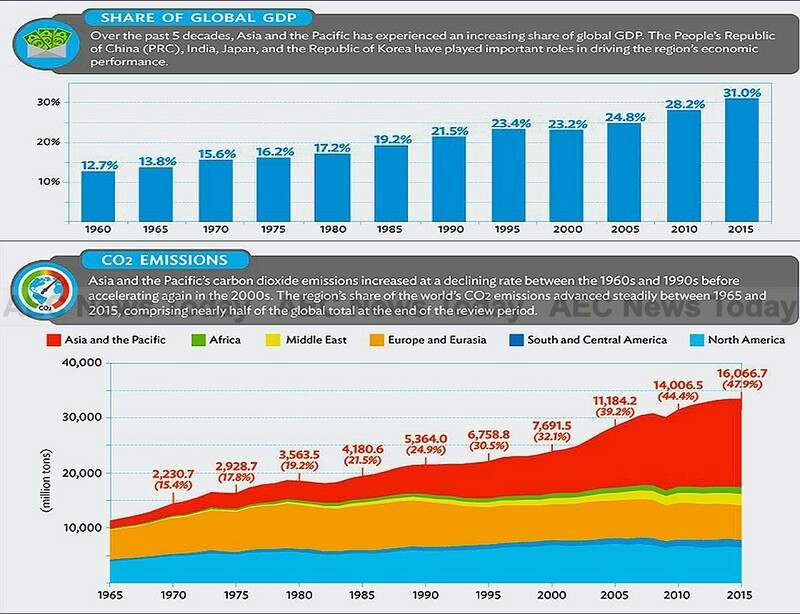 After having advanced steadily between 1965 and 2015, carbon dioxide emissions from the Asia-Pacific region accounted for half of the global total at the end of the review period. Despite the region’s increasing prosperity not all populations have benefited from the economic growth. In terms of 2011 purchasing power parity (PPP) there is remarkable disparities across economies, with Singapore’s per capita GDP being 44 times that of the Solomon Islands. 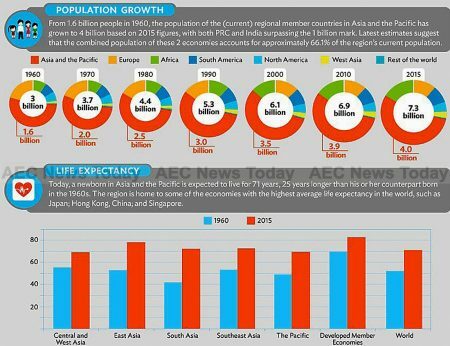 Life expectancy in the Asia-Pacific region has increased by 25-years over the last five decades. KIAP2016 notes that in the Asia-Pacific region some 330 million people are still living on less than $1.90 (2011 PPP) a day, with approximately 1.2 billion people living below the poverty line of $3.10 (2011 PPP) a day. Some 300 million people in the region live without safe drinking water and about 1.5 billion lack access to proper sanitation. In terms of population, the region has seen rapid population growth from 1.6 billion people in 1960 to 4 billion in 2015.